Parking Lot Striping St. Louis is the only pavement marking company that you should call when it comes to taking care of your parking lot maintenance needs in Missouri. Traffic, weather, oil spills, gum, and all other outdoor elements can and will cause damaged your parking lot all year long. If the current lines in your parking lot begin to fade or chip, we are ready to assist and make your parking lot look brand new. We can also help if you need a brand-new layout or a restripe, and we are ready to assist you today. Of course, we do line striping, but we also offer many other services to help you maintain your parking lot. If you happen to have an asphalt parking lot we can maintain your sealcoating to keep your lot protected and looking it’s best. 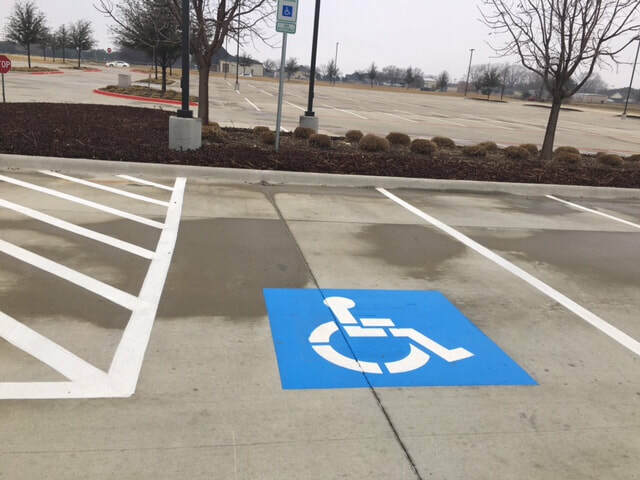 We also can assist with metal signage, wheel stops, speed bumps, custom stenciling, pressure washing and anything you need in your parking lot. Our crews are top-notch, professional, and experts at striping. We also use only the best paints and equipment to ensure that we supply the best striping service in the area. Our expertise is one-of-a-kind and you will love the results. We also offer the most competitive rates in the entire state of Missouri. We take safety compliance to heart and will not leave a job until your lot is fully compliant with all city, state, and local codes and regulations. Your parking lot will be properly marked with all the parking spaces, handicap stalls, no parking zones, and directional arrows when required to ensure that all traffic flows efficiently and safely. Our goal is to make your parking area a problem free safe zone for all your customers and patrons, with a smooth traffic flow through the entire lot. If you would like a free quote, please call us today at (314) 582-8849. Not only will we provide you with a free quote but we can answer all your questions about our striping services. We look forward to working with you and helping to keep your business looking great. 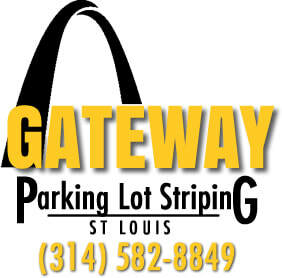 ​Parking Lot Striping St. Louis, MO is proud to be known as Missouri's best all-service parking lot maintenance company. We provide striping services to all types of businesses in Missouri, including but not limited to churches, retail shopping centers, commercial parking lots, retail chains, shopping malls, strip malls, real estate developers, airports, facility operations managers, restaurants, churches, car dealerships, movie theaters, and other paving contractors. Concrete and asphalt parking lots are no match for our crews that have experience with striping both types of surfaces. We are ready to help your business and there is no job too large or too small for our professional striping crews. We only use the best top quality striping paints that typically dry within ten minutes of applying, which is important because it allows us to stripe your lot during normal business hours when possible. ​We also understand that your business traffic flow is the life-blood of your business, and cannot be disrupted. We will work with you, your management staff or general contractor to schedule the best times for us to complete the striping and maintenance. If necessary, we can stripe sections of your parking lot at different times to ensure you always have parking areas for your patrons. Once we have the lot or a section of the lot free of vehicles and debris, we can start striping the area. Due to the quick drying times of the parking lot paint, we do not have to leave the parking lot blocked off for too long of a time, before it can accept vehicular traffic. The American Disabilities Act (ADA) requires that every business stay compliant with regulations that have been put in place to protect people with a handicap. Staying compliant is a must! Every parking lot must have a mandatory amount of handicap accessible parking spaces available based on the number of parking spaces in each 1,000 sq. ft. of utilized parking space in the lot. Depending on the size of the parking area, you may also be required to have a designated handicap van accessible area as well. ​Not only do our expert parking lot striping crews know all of the compliance regulations we will make sure your lot will pass inspection. We also install all signage to indicate the handicap parking areas, both metal signs, as well as the painted stencils in the parking stall. Safety and compliance are top priorities for us. Fire lanes exist to provide safety for you and your business. 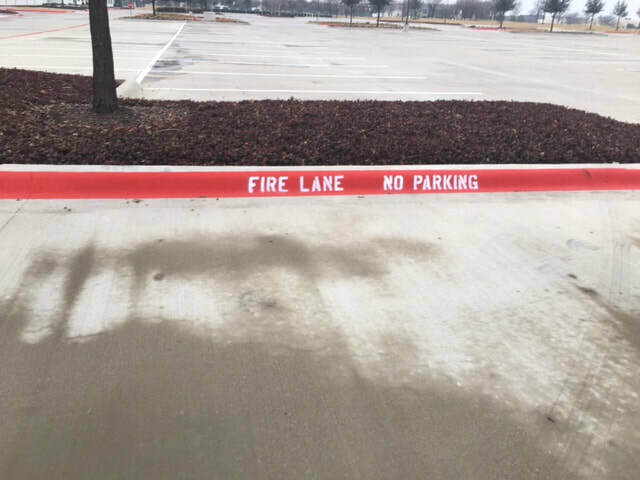 Fire lanes designated no parking zones, for Emergency Vehicles to park at your business in the event of an emergency. City codes dictate the exact requirements of where the fire lanes should be marked. Our crews will meet all of the codes resulting in your parking lot being up to code and fully compliant. Make sure you never get a bad report from the Fire Marshall for your parking lot not being compliant. ​You owe it to your clients and the entire city of St. Louis to keep them safe while visiting your business parking lot. Keeping traffic moving in the proper direction while in your lot is a safety concern for all business owners. Directional arrows can be a huge help to keep traffic flowing in the right direction. Parking lot size can be a huge factor as to if you need arrows to be painted or not. 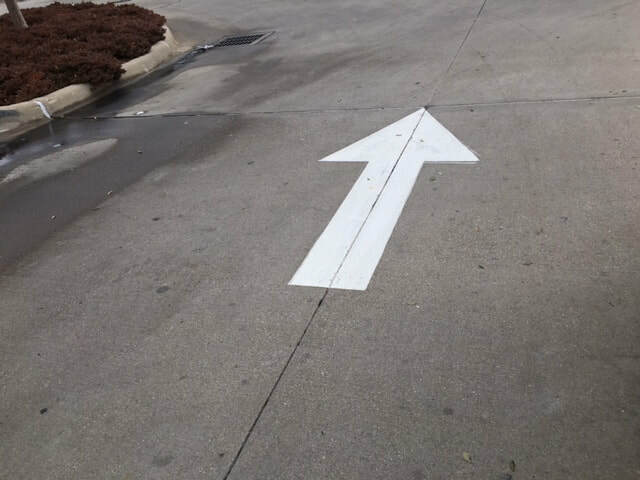 Directional arrows are typically found in the parking lots of banks, restaurants, car dealerships and other business lots that simply need to point drivers in a specific direction. We help you determine if your parking lot needs specific directional arrows, and the number needed. If your lot is in need of arrows, we will install the directional arrows properly. Maintaining your asphalt surface is very important for prolonging the life of your parking lot. Sealcoating adds a protective top layer barrier to your asphalt parking lot to help prolong the life of the surface. As vehicles drive and wheels turn on the asphalt parking lot, the top layer surface begins to wear down, and this is called abrasion. If you do not apply a sealcoat, this abrasion is occurring on the actual asphalt, which can be detrimental. When the sealcoat is applied, it actually becomes the wearable surface that will break down over time, leaving the actual asphalt base unharmed, and in great condition. As abrasion occurs to the sealcoat, over time you will need to reapply the sealcoat, which is the continued maintenance part. Sealcoating will weatherproof the surface by filling tiny cracks. If you do not take care of filling tiny cracks, then water can seep through down to the base, which will cause oxidation and deterioration. Protecting the original investment you put in your parking lot is very important, otherwise, you may find yourself spending huge amounts of money in the future to resurface the asphalt. Another great aspect is that the sealcoat surface will make your parking lot look brand new. The deep black coloring, along with crisp, fresh striping will make your parking lot look spectacular. Just like any other type of structure, continued maintenance is important to maintain the integrity of your asphalt parking surface. ​Wheel Stops, believe it or not, are a safety feature that is installed to prevent vehicles from causing damage to your property. Moving vehicles in your parking area can easily cause damage to buildings, walls, and other vehicles. Also known as parking blocks, or car stops, these seemingly irrelevant pieces of concrete or rubber really make a huge impact on parking lot safety. In a pinch parking blocks, can be installed as an alternative to curbs around the property. Wheel stops can be made from different materials, but you will mostly find them made of concrete, rubber, steel, and even plastic. Most often your budget will dictate what you put in your lot, but rest assured it will be money well spent to protect your property and visitors. Our professional crews are able and ready to install the wheel stops in your parking area. Keep in mind that although wheel stops are a safety feature to help prevent property damage, they can also be a tripping hazard for pedestrians if not appropriately placed. The car stops should always be illuminated suitably and painted to contrast their surroundings to help prevent tripping. Speed bumps are the best way to reduce traffic speeds inside your parking lot, especially if your business has a larger parking area. 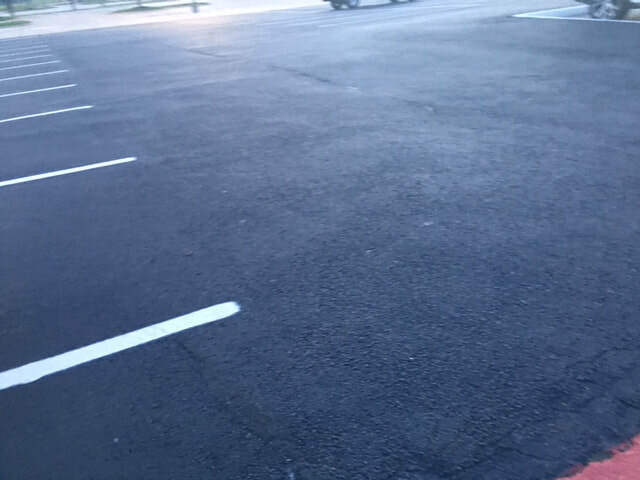 Being able to control vehicles speeding through the parking lot, will reduce the chance of accidents. The main purpose of speedbumps is ultimately safety. Although they serve to be a safety feature, speed bumps do need to be visible so that they are easily seen. If not seen easily speed bumps could potentially become a tripping hazard, or even cause damage to vehicles that may drive over them at a high rate of speed. Either scenario could cause significant damage so keeping the speed bumps painted so they are easily seen is a necessity. It is essential to have your speed bumps installed professionally. Our crews are experts when it comes to installing speed bumps, as well as removing or replacing your existing speed bumps. We are ready to assist you with all types of parking lot maintenance that may be necessary for your lot. ​Bollards are a great way to protect your property and provide safety to y our visitors. These barriers offer a huge amount of protection from moving vehicles. Depending on where bollards are placed, you may choose a plain bollard that is painted to coordinate with your building, or you may choose to go with a decorative bollard with lights. Bollards primary function is to help protect property from damage due to vehicles. Let’s face it vehicle accidents happen all the time, and parking lots are prime areas for vehicles to cause a lot of damage. For instance, banks and drive-thru restaurants typically install bollards to protect their ATMs and drive-through menus and windows from accidentally being hit by cars. Many dumpster areas have bollards installed to protect against the dumpster truck unexpectedly crashing into the dumpster pad wall. Fire hydrants, utility poles, gas pumps and so many other things can be protected by bollards. As with any structured, maintaining the property will not only keep it looking nice but will extend the life of the structure. When you keeping your parking area clean of debris, rocks, leaves, and dirt, you end up making it a safer place for the cars and pedestrians using it. Maintaining proper drainage in the lot is another way to add years to the parking surface. Promptly eliminating weeds out of the cracks will prevent long-term, irreparable damage. Oil can cause similar problems as water: breaking down the integrity of the pavement and weakening your surface, so keeping your parking area as clean as possible will be to your advantage. Providing a professional service to the businesses in St. Louis is what we love to do. We know that when we help keep your property looking great we are also adding value to the city and that is very satisfying. We also do warehouse striping, and sports striping too. The one burning question that everyone wants to know is how much it will cost to stripe their parking lot? We would love to discuss pricing with you, and provide you with a free quote. We will need to have a full knowledge of what is required in your parking lot to give you an accurate price, and we will be glad to provide a free quote. The size of your parking lot, the number of handicap spaces, the number of fire lanes needed, wheel stops, bollards, speed bumps, etc. These together will determine the final price. The good news is we have the best competitive pricing in the entire St. Louis area, and we look forward to servicing your business.